We just got back from an amazing family trip to the Rocky Mountains. I feel so at peace and at home when I’m there! This trip was sparked by a really good girl friend of mine, Marie-Michele Gagnon who is on the Canadian National Ski Team for Alpine Racing. Her and I met yearssss ago on the team and were instant friends and have been ever since. It’s hard to stay connected because we both lead such busy lives that don’t often overlap. She’s a pro athlete and, well, I’m a mom now! But we’ve both made an effort to stay in touch and see each other as much as we can. Last year she drove up to Edmonton just a few months after Ada was born and it was one of the nicest visits. She is one of those friends that it doesn’t matter how much time has passed, nothing changes and we can still laugh our asses off! Anyways, she told me she was racing in the Lake Louise World Cup Downhill and Super-G this year and I right away said we were coming to watch and sneak in a visit or two! Sadly in a training run before the race she crashed in a season-ending fall and wasn’t able to compete. The silver lining was that we ended up being able to spend a lot more time together to visit and catch up. Ada seriously crushed over her ‘Mimi’ and the two of them were instant pals…which totally doesn’t surprise me! 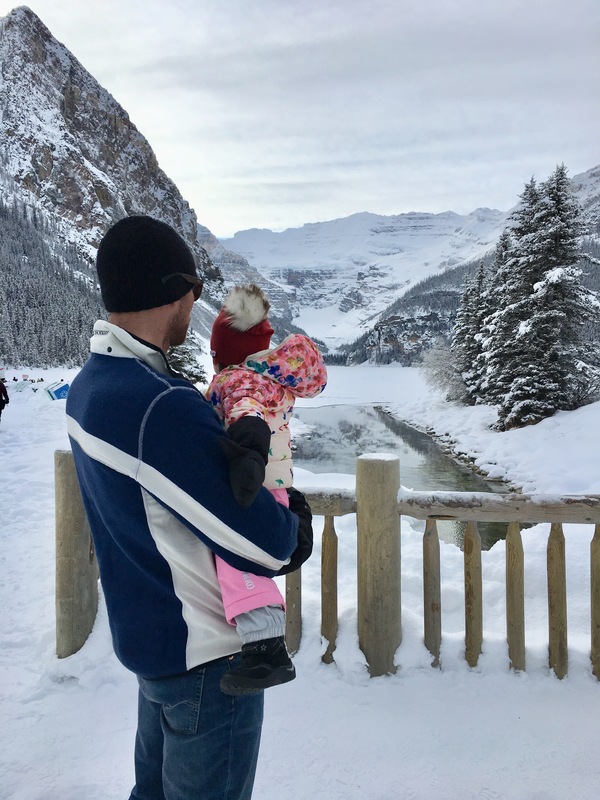 We went cross country skiing one day on Lake Louise in front of the Chateau, which is extremely picturesque! And then the next day we took a ice-hike up Johnston Canyon in Banff. Both were incredibly fun and memorable adventures! The smile on Ada’s face said it all to us, especially when we would get to our turnaround spot and celebrate with hot chocolate! I mean, the girl was in heaven. Although, I do have to admit there was one major lesson we learned…Ada has about an hour limit in the cold! She’s still so little and we had a hard keeping her hands and feet warm, especially because she was in the carrier and not skiing/running behind us. Both days, by the end of our adventures, her fingers and toes were pretty chilled. Poor girl. She was pretty upset, and rightfully so! MOM/DAD FAIL!!! Next time I’m bringing hot packs! Lesson learned. Christmas is certainly in the air! Our house is decorated and we’ve already been to a few Christmas celebrations already. Ada is enjoying her first advent chocolate calendar and all the Christmas music being played. Man she has a soul for music and dancing! She is also getting a kick out of the Christmas lights outside and says, “Ohhhhhh, soooo preeetttyyyy!” I can’t wait to take Ada to meet Santa! This is my absolute favorite time of year! I love winter, not just because of Christmas, but also because I am such a winter sport girl. The cold doesn’t get to me as much it does others – I’m constantly reminded of that when guests come over to our house and ask us to turn up the heat. So bring on more winter adventures! I hope to have another couple of weekends in the Rockies with my fam this winter! These are the days folks…these are the days! P.S. We totally forgot our good camera so these are just iPhone pictures…not the greatest quality, but it doesn’t take away from the great memories we made! I enjoyed every single one of your beautiful pictures.Merry Christmas to you and your family. What a lovely comment! Thank you for the note! Merry Christmas to you! !